About: The Cross Keys is a pub with a Pop theme and a relaxed and informal atmosphere. They serve a variety of British dishes and seating on the terrace area is provided, weather permitting. Catering for private parties is available upon request. Every entrance into The Cross Keys on Endell Street should include a little respect paid to the magic floral display going on outside it, all year-round. Hanging baskets and window boxes cover the façade to create one of the most welcoming pub entrances in the whole of London. Inside it is all dark, dim glow bulbs, solid pub furniture, carpet and brass. No lie, this is one of the best pubs in central London. "A pub unaffected by fads and trends"
Pretty flower boxes, classic copper utensils decoratively displayed and a cosy dim interior put the Cross Keys into a category that many others might fall into in Central London but something sets it apart. That something probably isn’t the big sandwiches and pub grub menu that they offer, not that it is bad, just a little ‘meh’ - take it or leave it. It’s something else entirely. Community, intimacy, charm? All of the above. 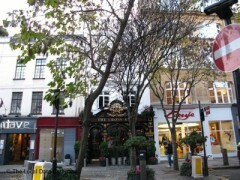 Located on Endell Street in Covent Garden, The Cross Keys is a workers pub, frequented by regulars from surrounding businesses. The flowers on the façade are over the top and oddly out of the ordinary for this little shopping stretch. Inside, pop memorabilia finds pride of place on the walls, the lights feel like they’re as low as they go and that inimitable bustle of a real London pub is always on show. You’ll find some good ales on draught along with a selection of the usual European lagers. Take your drink to a table – they can be hard to find – settle down and enjoy the buzz of a pub unaffected by fads and trends. The Cross Keys is a lovely place, particularly worth paying a visit at Christmas. Nice place. I have been there a few times and each time it was lovely. Bear, staff, service...everything was great. I'll put it out there: The Cross Keys is quite possibly the cosiest pub in London. Even the exterior - covered in hanging baskets filled with flowers - gets you tingling. The weird red hue on everything inside is just magical. Go at Christmas and you will not be sorry. I never am.